Thinking About Moving to Branson? Recognized as one of the most vibrant communities in the United States, Branson is an ideal place to raise a family, start a business or enjoy retirement. Citizens of all ages enjoy numerous recreational activities, employment opportunities, scenic beauty, and mild climates. Although small in population, Branson has the amenities of a large community. With a robust economy, well-funded schools, moderate cost of living, entertainment and gorgeous residential homes, you'll find Branson to be a unique and fun place to live. Revenue from tourism helps keep Branson city taxes low. In fact, the cost of living in Branson is roughly 6 percent below the national average! Throughout the Tri-Lakes area, a wide variety of homes and prices can be found. From multi-million dollar lakefront estates to moderately priced single family homes, you'll find the right place for you. Especially if you choose Charlie Gerken to assist with your home search! Branson presents various careers choices in professional services, retail, entertainment, crafts, food service and hospitality industries. Wages are above the national average and many positions include full benefits. Whatever career opportunities you're looking for, you'll find them in Branson. How many other cities in the United States offer you the choice to be a doctor or an incredible acrobat? Branson's hospital and specialty clinics provide a full range of healthcare services for residents and visitors. Cox Community Health Center, a 111-bed hospital, was recently rated among the top ten in Missouri and one of the United States 100 Top Orthopedic Hospitals. Many excellent medical doctors are on staff at Skaggs. Specialties represented by Skaggs' medical staff of more than 100 physicians include: anesthesiology, cardiology, emergency medicine, family medicine, family medicine/obstetrics, general practice, general surgery, gynecology, infectious disease, internal medicine, nephrology, neurology, obstetrics, gynecology, occupational health, oncology, ophthalmology, oral and maxillofacial surgery, orthopedic surgery, otorhinolaryngology, pathology, pediatrics, plastic and reconstructive surgery, psychiatry, pulmonology, radiology, thoracic and vascular surgery, and urology. Branson is served by Cox Community Health Center and a federal 911 emergency system program. The Branson Police Department serves the community 24-hours a day in areas of traffic, patrol, communications, investigations, jail, and records. All Branson police officers are certified under the Missouri Police Officers Training Act and are cross-trained in emergency medical services and water rescue. Branson's police, fire and rescue teams professionally care for the community and its visitors. Located amongst the Ozark Mountains, the city of Branson is 13 miles north of the Arkansas state line and 35 miles south of Springfield, Missouri. Most visitors arrive by automobile, entering the Branson Tri-Lakes area from U.S. Highway 65 or Missouri 160. In 2009, the Branson Airport was established bringing in thousands of new visitors with convenient non-stop flights from all over the United States. Southwest Missouri's largest commercial airport is the Springfield-Branson National Airport, located 45 miles north of Branson. The closest private airport is at the College of the Ozarks in Point Lookout, just 3 miles from Branson, which serves as a facility serving non-commercial aircraft. The Union Pacific Railroad carries freight into the Branson Tri-Lakes area which includes western Taney County and southern Stone County in southwestern Missouri. The Branson Tri-Lakes area is blessed with four distinct seasons, offering spectacular views of wooded hills and lakes. Clean air and clean water, scenic highways and hiking trails draw visitors year-round. Gorgeous Dogwoods and Redbuds blossom in the spring as well as colorful foliage each autumn. Wild flowers and animals including deer, foxes, coyotes, bobcats and birds are abundant. Precipitation is largely in the form of rain, with an average total rainfall per year of 40 inches. Average snowfall per year is 15.9 inches. Now with season-extending programs, many Branson businesses are open year-round. Each passing year, more and more people are coming to Branson between Thanksgiving and New Year's. Nestled in the beautiful Ozark Mountains, Branson is a great place for entertainment and outdoor activities. Locals and visitors enjoy a broad range of opportunities for camping, biking, canoeing, hiking, boating, picnicking, and other outdoor activities. Public and private nature parks are spread throughout the area as well as ten world-class golf courses. Hunting seasons are regulated by the Missouri Department of Conservation. Outdoor theaters provide plenty of drama under the stars while daytime recreations wear kids out quickly! Branson is home to three breath-taking scenic lakes. Locals enjoy swimming, fishing, boating, jet skiing, parasailing, snorkeling, tubing, camping and more. 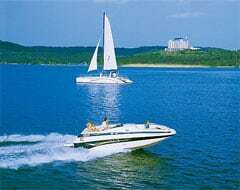 Table Rock Lake, created in the late 1950’s, is a popular recreational lake, just 10 minutes south of Branson. You’ll see plenty of locals and visitors alike “living it up” through recreational boating, swimming, parasailing, scuba diving or any other freshwater activity. Tucked away in coves are beautiful lakeside properties and cozy weekend resorts. Largely known for its awesome bass fishing, Table Rock Lake has become increasingly popular as a tournament site as well. Lake Taneycomo begins at the Table Rock Dam south and west of Branson, winding 22 miles to Forsyth, Missouri. Formerly a portion of the White River, the construction of Table Rock Dam turned Lake Taneycomo into a cold-water lake offering year-around rainbow trout fishing straight from the hatchery! An excellent environment for trout, Taneycomo attracts anglers throughout the year, making it Missouri 's #1 trout fishing lake. 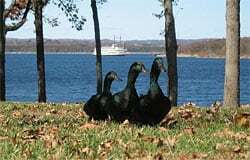 Bull Shoals Lake begins at Forsyth and offers much of the same recreational and sporting opportunities as Table Rock, but in a less populated and developed environment. Bull Shoals is a local favorite for smooth-water skiing and scuba diving. Three enormous factory outlet shopping centers gained Branson a national ranking for the second largest outlet shopping destination in the nation! Several large discount stores and hundreds of unique stores offer a variety of clothing, hand-crafted gifts, house wares, luggage, jewelry, shoes, and other fine assortments at reduced prices. The 76 "Strip" and historic downtown offer hundreds of tasty restaurants and appealing shops waiting to be explored. Dozens of antique shops and flea markets offer collectibles. Custom made and other specialty items from home furnishings to jewelry are readily available at craft villages and arts and craft malls throughout the area. Make way to the Branson Landing to take in the splendor of a new $420 million recreational development on Lake Taneycomo. Over 140 luxury waterfront condos align with 100 fine dining and retail shops anchored by Bass Pro Shops and Belk. Included in the complex is a Hilton 4-star, 260-room convention hotel, and 220,000 square feet convention center with boat marina. Stroll down the Branson Landing's boardwalk while being entertained by dozens of street entertainers and two high-tech water fountains. The main water fountain features six canons shooting water 120 feet in the air along with 13 fire cannons shooting balls of flame dissipating at 40 feet, with the water and flames synchronized to music. This $8 million fountain was manufactured by Wet Design, the company responsible for several well-known fountains, including the one at the Bellagio Hotel in Las Vegas. More live entertainment theaters are located in Branson, Missouri than anywhere else in the United States. 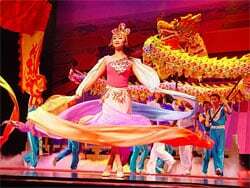 The area offers a vast amount of entertainment with more than 45 theaters and 100 shows filled with music, magic, comedy, special effects, animals, trick-riders, water displays and pyrotechnics. Branson is world-famous for its assortment of music entertainme nt, including country, pop, rock n' roll, swing, classical, gospel, and Broadway. Throughout the day, visitors can watch breakfast shows, matinees and evening performances. Branson boasts two major amusement parks: Silver Dollar City and White Water. Silver Dollar City, built in 1960 atop MarvelCave, is a turn-of-the-century Ozarks village featuring the handcrafts and artwork created by resident crafters, mountain music at locations throughout the park, street shows, restaurants and snack stands and themed rides such as an 1880’s steam train, log flume and others. It has been Branson's largest single attraction throughout its history and is one of the Midwest 's leading attractions. Shepherd of the Hills Homestead and Outdoor Theater, opened in 1960, is the home of the nation's largest outdoor historical drama. Named after one of the most widely read novels in publishing history, Harold Bell Wright's "The Shepherd of the Hills," the novel is re-enacted nightly by a cast of native players in a huge outdoor amphitheater. The Homestead offers crafts, music, shops, games, trail rides and other entertainment during daytime hours, as well as the 230 foot Inspiration Tower and the historical "Old Matt's Cabin". From miniature golf, to numerous Go-Kart tracks and amphibious lake rides, if you get bored in Branson – it's your own darn fault! Branson takes its education seriously, offering well-funded, modern facilities to the Tri-Lakes area. Currently, there are five public schools and three private schools in the Branson R-IV district. To serve its more than 2,500 students, Branson Public Schools employs over 150 teachers, holding a low teacher-to-student ratio of 1 to 16. Private schools, such as New Life Academy, not only focus on high academic standards, but Christian ethics as well. Reeds Spring Public Schools have taken steps toward becoming Professional Learning Communities (PLC). PLC includes teacher collaboration, a Freshmen Mentoring Program and guided study hall for students who need extra help. Regardless of your choice, you'll find area schools to be well equipped with excellent educational tools, athletic facilities, and resourceful science and computer labs. The College of the Ozarks is located just south of Branson in Point Lookout. This four-year college, 1,000 acre campus is home to over 1,600 students. Nationwide, the college has gained a reputation for strong academics and is commonly referred to as "Hard Work U." There, the college hosts dozens of programs for students to work their way through college instead of paying tuition. Branson Vocational schools and many public interest groups offer education in the area as well, including the Omar Gibson Vocational Technical School and Ozarks Community Technical School. Branson Hills Golf Course: An award-winning course honoring Legendary Missouri Golfers featuring five teeing areas nestled in the beautify of the Ozarks. Pointe Royale Golf Course: A premier championship course located in a scenic condominium resort setting in Branson on Lake Taneycomo just below Table Rock Dam. 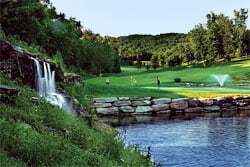 Thousand Hills Golf Resort: A 5,111 yard, 18-hole course, Thousand Hills is conveniently located in the heart of Branson near just about everything. Holiday Hills Golf Club: Located three miles east of downtown Branson Landing, newly renovated Holiday Hills offers a 5,771 yard, 18-hole course. Ledgestone Golf Course: Located in Stonebridge Village, Ledgestone is a 6,724 yard, 18-hole course with scenic and challenging terrain. Branson Creek Golf Club: This Tom Fazio-designed 18-hole course offers 7,012 yards of scenic and challenging golf. Top of the Rock Golf Course: This 9-hole executive course was designed by Jack Nicklaus and offers 1,330 yards overlooking Table Rock Lake. Branson attracts over 9 million visitors annually from around the world. Branson boasts the #1 theme park in the world: Silver Dollar City. There are over 50 music theaters, 300 hotels, and 200 restaurants. Offers more theatre seats than Broadway and Las Vegas combined. Roy Clark was the first of the national country stars to give his name to a theatre. Silver Dollar City was created by those making crafts while waiting outside the depths of Marvel Cave. Originally, Branson drew tourists because it had a commercial ice plant, soft drink bottling plant, candy factory, and an ice cream factory all next to the waterfront. Tourists came to Branson in the 1930's largely due to Harold Bell Wright. He wrote the Shepherd of the Hills, a novel based on the the Ozark area and its settlers. It took 4 years to build Table Rock Dam with an estimated construction cost of $65,420,000. The Presley's were the first to erect a metal building in Branson and waited each night for guests to show up. 1907: Harold Bell Wright publishes the novel "Shepherd of the Hills". 1912: Branson is incorporated with 1,200 residents. 1932: Lake Taneycomo becomes a popular destination and inexpensive vacation spot. 1945: Hugo Herschend and his family relocate from Chicago and lease Marvel Cave. 1958: Table Rock Dam is completed after four years of construction. 1959: The "Baldknobbers" hold their show in the basement of Branson City Hall. 1961: Silver Dollar City opens as a "crafts show" for the local artisans. 1975: Gerken & Associates Realtors® established! 1976: A 2-lane highway is completed to accommodate the increasing number of visitors driving to Branson. 1982: Three new large-scale theaters are completed, including the Starlite Theater. 1987: Box Car Willie becomes the first celebrity to open his own theater in Branson. 1988: The Factory Merchants Outlet Mall, commonly referred to as the “Red Roof Mall,” opens. 1989: Inspiration Tower at Shepherd of the Hills opens to the public. 1990: The Ozark Mountain Christmas celebration takes place extending Branson’s tourism season by four months. 1991: Branson receives national recognition as a great place for entertainment from Wall Street Journal and 60 Minutes. 1993: Over 22 theaters feature national stars like Mel Tillis, Mickey Gilley, Ray Stevens, Moe Bandy, and Buck Trent. 1995: Andy Williams, the Osmonds, Tony Orlando, Bobby Vinton, Wayne Newton, and Jim Stafford construct theaters. 1997: "Shepherd of the Hills" celebrates its 5,000th show to become America's most performed outdoor drama. 2003: Branson hosts over seven million visitors, almost half of them coming from 300 or more miles away. 2004: Branson Landing is announced and downtown planning begins. 2006: Branson Landing opens and the Chamber of Commerce membership exceeds 1,200. 2007: New state-of-the art Branson Convention Center and adjoining 12-story Hilton Hotel open. 2009: Branson Airport opens with a 2-day air show featuring the U.S. Air Force Thunderbirds. 2010: Four new ziplines become the latest additions to the tourism industry. 2011: A new downtown bridge was completed over Lake Taneycomo. 2012: Branson celebrates it's 100 years incorporated as a city. 2013: Outlaw Run at Silver Dollar City named Best New Ride in the world of 2013 by Amusement Today. 2014: Johnny Morris reopens Top of the Rock, a Jack Nicklaus-designed par-3 golf course. 2016: Factory Merchants Outlet Mall transformed into Balllparks of America, a complex of replica ballparks. 2017: Over 9 million folks visit Branson. 2018: Silver Dollar City opens Time Traveler, the world's fastest, steepest, and tallest spinning roller coaster.